You met Dagmar Bruckner and her husband Gunnar yesterday at Kiez Eis blogpost. Here she is in her gallery/store, just around the corner from the ice cream store. Dagmar’s first career was Occupational Therapist but about fifteen years ago while living in Brooklyn, she learned how to make glass beads. She demonstrated the making of a glass bead. The colored glass rods are from Murano, Italy. She lit her torch and melted the end of the rod to the consistency of honey, turning it all the time onto a metal tool. Sometimes she uses a mold to form the bead but most of the time she creates each bead by hand without the mold, so they don’t lose the handcrafted touch. Once a month dbeads conceptstore hosts concerts. Her graphic artist made these bumper stickers with this saying! She gave me a couple to bring home. Thanks Dagmar for being part of the People at Work Series. She suggested a new project for my next visit to Berlin- Artists at Work! Go in and out the window- or through! It’s the Weekly Photo Challenge by Michelle Weber at WordPress- Windows! She asks What do you see though yours? I went back a few years and looked through the archives and there are lots of window images. Car windshields, curio cabinets, subway and train windows, house and downtown office windows, refrigerator and store window displays. Old seltzer bottles, a birdcage, the texture of the wicker, some stained glass at dusk. J’s front porch with the sun sinking behind. Condensation inside the old glass, the metal tops. Artists usually arrange inanimate objects to create a still-life to paint or draw. This was already there, waiting. But then it is an artist’s house. Sparkling and colorful, glowing and shimmering. Beautiful display with candlelight throughout the show. 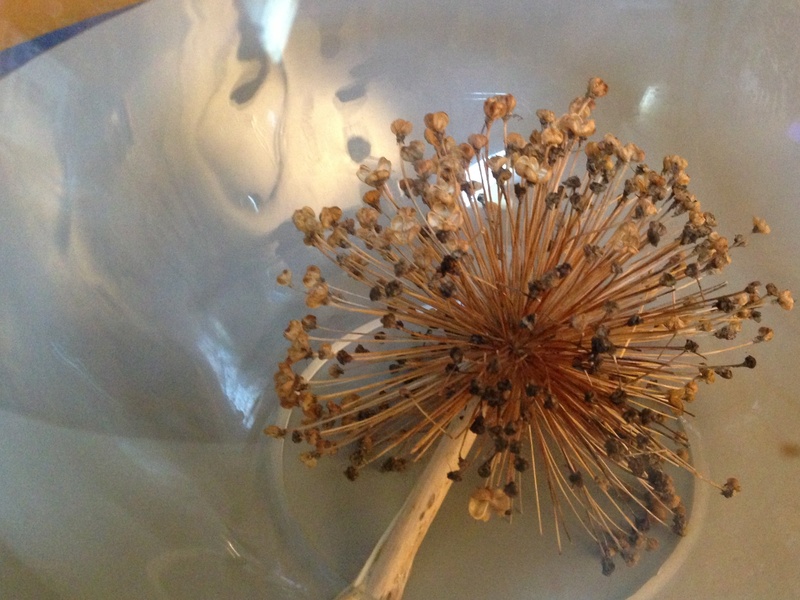 My artist friend J gave me a dozen stems of dried Allium from her garden. J knew that they’d be great for pictures. The kids enjoyed arranging them and taking photos of the outer space orbs. After school I tried putting one into a glass globe my neighbors had given me (minus the crazy centerpiece, which has since been trashed). The top flower had broken off from the stem but didn’t take away from the dried flower end. The round glass globe creates some interesting effects in the images. I see that you need to plant bulbs if you want Allium in your garden next Spring. I’d always wondered what they were when I saw the tall purple alien- looking flowers. Some of the flowers were gigantic. The stems are called scapes. My food blogging friends know allium well. I just didn’t know what they were named. Shot with iPhone.